One of my major annoyances with Snow Leopard is the lack of support for creator codes—no longer can you assume that double-clicking a file in the Finder will open that file in the application that created it. While some like the new behavior, many do not. If you’re one of those in the latter category, I covered one solution, LaunchCodes, back in January, but Michael Fortin’s Magic Launch is even better, and it's just what I've been looking for. Magic Launch is a System Preferences pane that runs a tiny background process—technically a launch agent—any time you double-click a document; this process intercepts the system’s calls and routes to the program of your choosing the command to open that document. Once the desired program is launched, Magic Launch's agent quits, thus requiring no system resources when not in use. 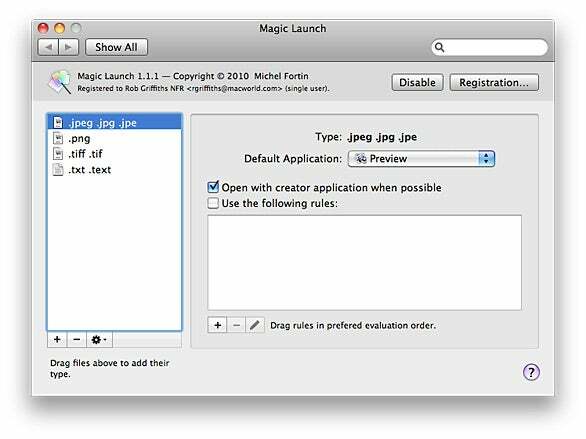 How do you assign a document type to an application in Magic Launch? The simplest method is simply to add the desired file extensions to the list of file types handled by Magic Launch; for example, if you want Magic Launch to intercept requests for text files, add the .txt extension to the list. You add file types either by typing file extensions or by dragging and dropping files into Magic Launch's list; Magic Launch knows about most common extensions, and will automatically add, for example, .text if you enter .txt. Once a file type is added, you can choose the application to open that file type in either (or both) of two ways: by enabling the use of creator codes (if the originating program adds them to files it creates), or through custom rules you create. The creator-code approach works well for most of the file types that irk me in Snow Leopard, because my most-used programs (BBEdit and Photoshop among them) add creator codes. For many users, enabling this option will suffice to regain Mac OS X 10.5-style document-application associations. The real power of Magic Launch, though, comes from its rules, which can, for example, force documents with a common file type—say, .jpg—to open in different applications, depending on particular criteria you establish. For example, while I’m tweaking images for a Website, I want my .jpg files to open in Photoshop. But once that site is done, I want the same images to open in Preview for quicker eyeballing. This is easily handled with two rules in Magic Launch, as seen in the image to the right. 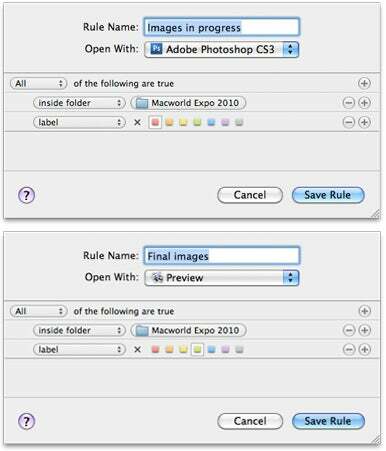 The first rule tells Magic Launch to open a .jpg file in Photoshop if it’s both in my “Macworld Expo 2010” folder and the label is red. The second rule tells Magic Launch to use Preview for .jpg images that are in that same folder but have a green label. In other words, simply changing the image files' label from red to green changes the program that opens them from Photoshop to Preview. In my testing, Magic Launch worked very well, used no measurable system resources, and gracefully solved the problem Apple introduced with Snow Leopard. It's well worth its cost if you spend a lot of time working with the “generic” file types—text files and images, especially—most affected by this change.